I LOVE eating Omelettes for breakfast, but I don’t particulary love the time it takes making individual ones. That’s when I make this baked version that feeds my whole family! 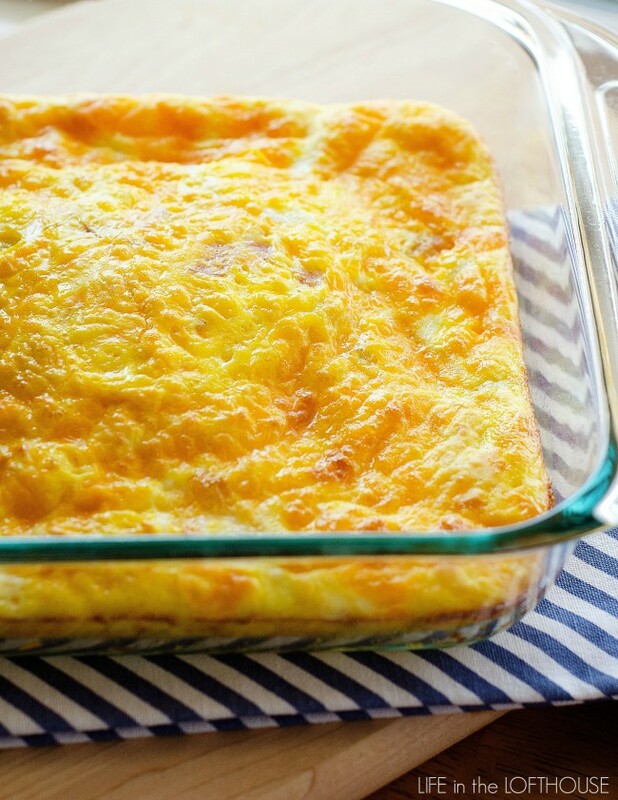 This baked omelette could not be any easier to whip up. 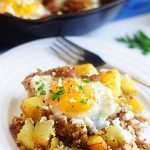 It’s also so versatile in the way you could add just about any extra fillings you like. 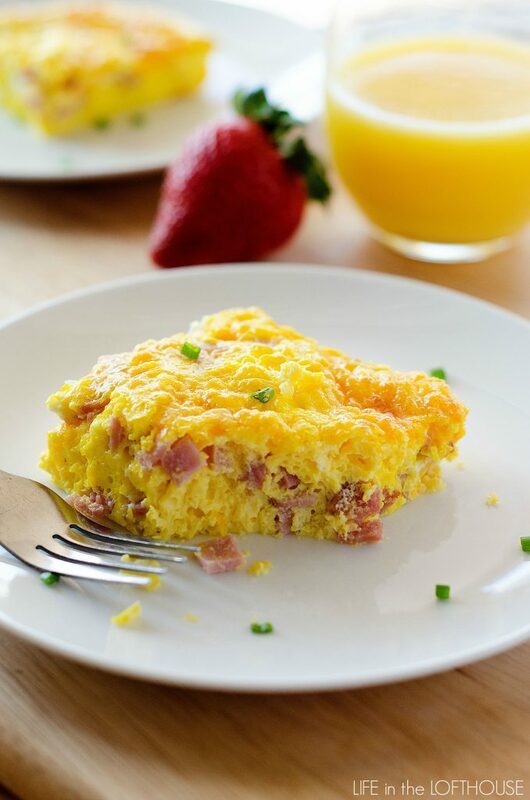 When I’m feeding my picky kids I usually make this ham and cheese version. When I make it for Kale and I, I like to add chopped tomato, spinach and any veggies I can get in it. This omelette is easy enough to make on a weekday morning and fabulous enough to serve guests for a weekend breakfast! It doubles beautifully. Just use a bigger baking dish. 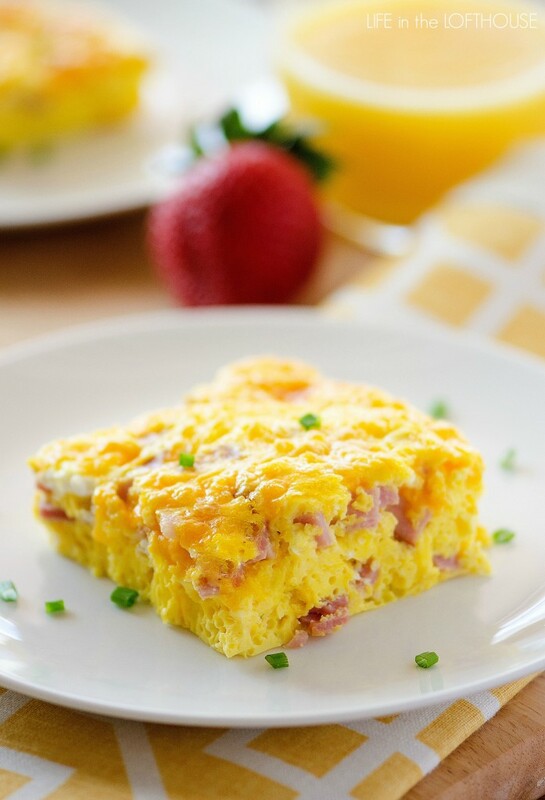 A baked omelette loaded with ham and cheese! Preheat oven to 400° F. Spray a 9x9 inch baking dish with cooking spray. In a large bowl, whisk eggs and milk until combined. Stir in cheese and ham. Pour mixture into the prepared baking dish. Bake, uncovered, for 25 minutes or until golden brown and cooked through. Remove from oven. Let stand 5 minutes before slicing and serving. Serve with chives, if desired. This recipe easily doubles. Use a 9x13 inch baking dish when doubling. 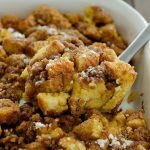 My husband and I just started a low carb diet this week and this will work perfectly for our busy week days. My husband gets up at 3 in the morning and I do not get up with him to fix him breakfast (I treasure my sleep and getting up at 5:30 is bad enough). This will be perfect to fix on Sunday and put in individual containers for him to take to work and pop in the microwave when he is hungry! Thank you Holly! You are a genius! I wasn’t able to open the ham and cheese omelette recipe. 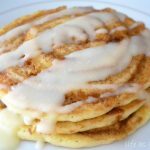 I am having a really hard time getting your recipes moved to pintrest. I love your recipes, but really frustrated….any hints? Thanks, Marlene! 🙂 Miss you!! Can’t wait to try this. I was happy to see a smaller size. Do you like to serve anything special with it? I was thinking of a bowl of fruit and maybe cinnamon toast. Thanks for the recipe. I like to serve it with fruit! Made it this morning & loved it. Do you ever try it with another meat (bacon, etc)? Thanks for a great recipe. Any salt or pepper in this recipe? If you add spinach, do you just use fresh spinach? Wanted to ask if I could prepare this ahead of time and put in the oven first thing in the morning?